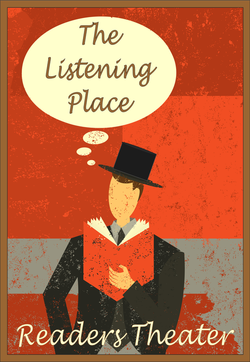 Welcome to The Listening Place Readers Theater! Annie Nations, an indomitable Appalacian widow, lives on her mountain farm with the acerbic ghost of her husband Hector. Add some foot-stomping music and "Foxfire" quivers with laughter and stabs the heart. Performed by Philip Pearce, Richard Boynton, Susan Keenan, Kalyn Schubnell and Robert Colter. Monterey Museum of Art, 559 Pacific St., Monterey. Free to MMA Members and free to general public with $10 museum admission. ​No advance reservations. Call 831-424-6645 for information. The Listening Place Readers Theater creates read-aloud performances of plays by the great playwrights. Read by Monterey County's finest actors, these plays come to life as stories, with character voices, gestures, and deep emotion. From comedy to drama, The Listening Place, Readers Theater creates a totally entertaining theatrical experience. Read about our past shows by clicking here. Our loyal friends and patrons! Thank you for your support!